Twitter is a social network with 320 million users. Real-time 140 characters texts are coming out each minute. Where else could you find better content? *ONLY AVAILABLE TO SELECTED MARKETS! Although Twitter’s user numbers are a far cry from Facebook's 2.3 billion active accounts, the short message social media brings a constant flow of current content from all over the world. Take advantage of this endless content feed to promote your company or entertain your clients! In your App Gallery (How to Add Apps) you will look for “Social Networks” on the sidebar menu on the pop-up window. Click on Twitter. You will be prompted with the App settings. Make sure you have a Twitter account integrated to OnSign TV, even if you don’t plan on displaying your own tweets. You need to give permission to OnSign TV to access your Twitter account for the platform to read your tweets and check who you follow. 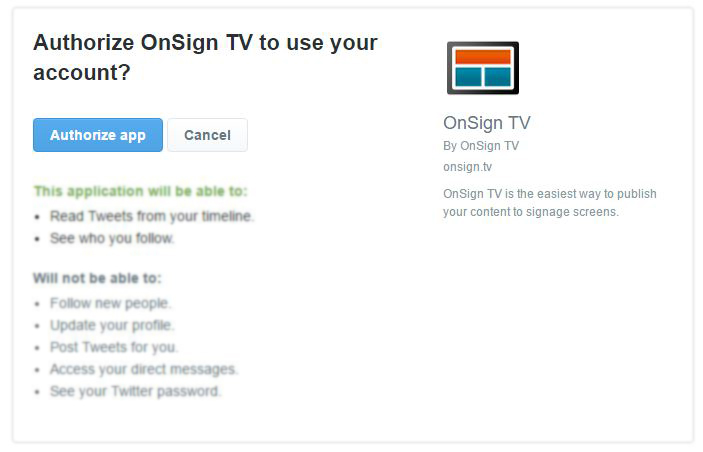 * You can only link one Twitter account to OnSign TV at a time. Search by: Paste the username from the person, company or group you want to share on your screen. Access the accounts profile and copy it to this blank. If you want a more diverse stream of content, this also works with hashtags. Number of posts: Set the number of posts you want displayed. If you want to share only the latest posts set a lower number like 10. Vary the number depending on channel theme and updating frequency. Show each post for this many seconds: As each tweet contain a maximum of 140 characters and a photo, reading time may be as low as 10 seconds! Take into account the amount of information displayed in other divisions of your screen, the monitor location and the target audience. Language: There will be info displayed besides the tweet, such as date and channel. Choose in which language these texts are to be displayed. It does not interfere with the tweet. Besides, you can set a custom background color to match your signage content style or set a background image. Once you are done, click “Preview”. If the result is what you expected, hit "Save". The Twitter App can be displayed fullscreen, in bar or even smaller areas. It is up to you!